EFM Racing provides you with all the support and "tools" necessary for you to simply arrive at the track and drive your race car to it's (and your) limits. Our professionally built and maintained cars (or our prep on your car) combined with our unparalleled trackside support let you focus on your business and your driving without the worry of preparing and transporting your car or finding a crew to help at the track. Are you a young driver looking to make the transition out of karting? We have specific, detailed and successful, proven programs for that. Are you an experienced racer looking to improve your abilities and/or car to challenge for a regional title or National Championship? We have great programs for that and several National Championships to back that claim up! ​Are you a novice racer looking to either get started in racing or improve your skills and gain experience? EFM Racing has helped dozens of drivers "learn the ropes" and make the move from novice to veteran with ease by benefiting from our vast experience. From the west coast based Formula Car Challenge Series all the way up through the Mazda Road to Indy with USF2000 and Pro Mazda, EFM Racing provides Championship winning support through our own in-house programs or through our extensive partner relationships. 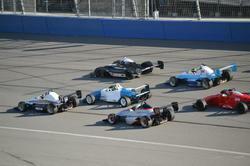 EFM Racing can help you achieve your goals in motorsports. Whether you are a young and upcoming driver looking to make the jump from karting to cars, an experienced club racer looking to up his game and go after a championship or national title, or a novice looking for the best support available to get your racing efforts started correctly, we provide all the tools necessary to succeed. Benefit from our experience and accelerate your program! With decades of experience in racing, and a wide array of cars, classes and series as part of that experience, EFM Racing and their staff can provide professional support services for vintage racers as well. Many of the cars that are popular in vintage racing now were cars we worked on early in our careers. Whether you need a complete frame up rebuild, a basic prep. race weekend support or simply an alignment on your car, we're happy to help.